The understanding about agroindustry is needed because it is a bridge between production activities and agricultural product marketing in Indonesia. Understanding agriculture can be a base for young generation to develop innovation in agroindustry that ease people’s lives in the future. Industrial Technology Students Association (Himalogin) IPB University conducted Agroindustrial Academy (AA). AA is a platform to understand agroindustry which is specialized for students of General Competency Education Program (PPKU). This activity started from February until April 2019 and is held annually. “AA aims to introduce new students of Department of Agroindustrial Technology (TIN), Faculty of Agricultural Technology (Fateta) about the daily university life before actually entering the department, like introduction about stream and industry in the real world. Agroindustrial Academy consists of 5 series of event; first meet-up, product presentation, product-making, industry visit, and closing ceremony. The concept of AA is emphasized in the industry visit, because it usually only took place by the end of the 5th semester,” said the Head of Committee of AA 2019, Friesca Rifani. 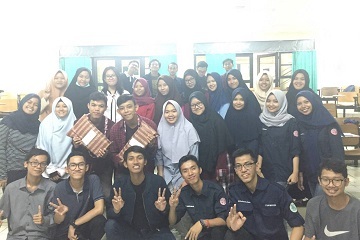 The first meeting activity was focused to the introduction of agroindustry as well as team-forming. The participants will then present the prototype of their respective teams. The most innovative and applicative product was chosen based on the assessment from Himalogin IPB. After the presentation, the most innovative product went to Dragon Tea. It will be produced in Sapta Canteen IPB, IPB Dramaga Campus. “Tantangan menjalani AA ini yaitu masih sedikitnya minat mahasiswa PPKU yang ingin ikut kegiatan ini. Mahasiswa yang berminat tahun ini lumayan lebih banyak dibandingkan tahun lalu. Salah satu hambatan lainnya rencana kunjungan industri yang dilaksanakan di akhir pekan. AA selalu diadakan di akhir pekan sedangkan pabrik dan Usaha Mikro Kecil Menengah (UMKM) kebanyakan tutup,” tambah Friesca. Harapan Friesca ke depannya mahasiswa lebih paham mengenai agroindustri dan industri dalam bentuk nyata. (Ghinaa/ris). “The challenge in running AA is the lack of interest from PPKU students to participate in this event. Thankfully there are more people this year than it was last year. Another constraint is the industry visit plan which is held on the weekend. AA is always held on weekend, whereas Small and Medium Enterprises (SMEs) usually are closed during weekend,” added Friesca. She hoped that in the future the students can understand agroindustry and its application in the real life.